Affiliate Links // Some items in this post were provided courtesy of the brand are labeled as c/o. Do you ever get all dressed up, then look outside only to realize it’s since started pouring down rain? That’s exactly what happened a few weeks ago when I was getting ready for a bridal shower, and a blogger get-together. With plans like that, I had to reach a certain level of dressed up, and the weather was just not cooperating. When the weather turns rapidly, the internal struggle starts. Will I look silly if I wear this outfit outside in the rain? Is this even practical? There’s a certain point in the year where tights become obsolete in my wardrobe, and I just grin and bear it. With my tights already packed away for next year’s fall and winter, this was one of those days. As a Pacific Northwesterner, this struggle happens fairly frequently. We’ve been incredibly lucky to hit 80 degrees on many of our spring days this year already, but our weather is known to turn rather quickly. Just last weekend we had another freak rain storm that left nearly as quickly as it came. So what to wear on a rainy day like this one? I think my number one item to battle freak weather is having a few types of lightweight jackets in my wardrobe. A trench with a hood is a must for me because it means protecting my hair when the rain is particularly unrelenting. This wasn’t one of those days, so I opted for a lightweight knit jacket. It kept me warm enough yet was lightweight enough, so I didn’t look like I was confused on what season it was. I also love a good moto jacket and a fitted cargo jacket for the spring because they go with everything. Hold the phone, someone in Seattle is recommending an umbrella?! If you’re from this area, you’ll know that most native Seattleites can spot a tourist a mile away from an umbrella. While I normally agree with this sentiment, if you’re going to an event that requires you not to look like a drowned rat, sometimes you just have to give into the umbrella. Just think, this can be another way to make a fashion statement! 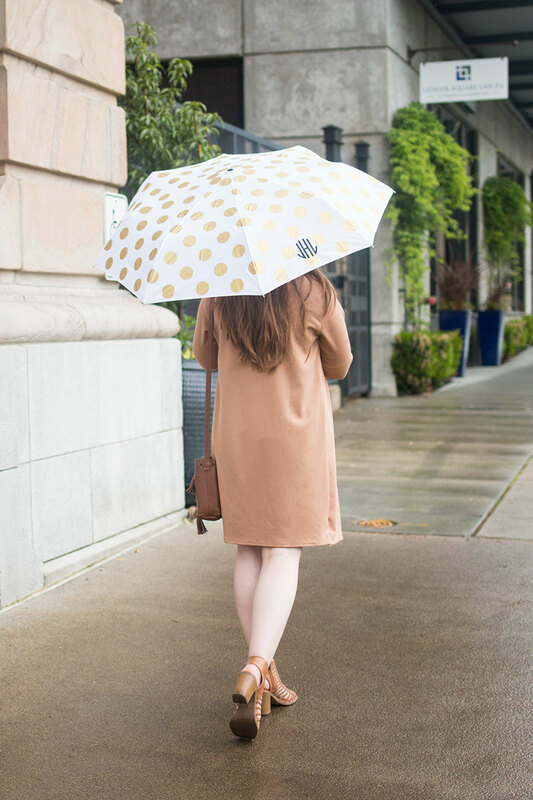 The darling umbrella I’m wearing here comes from Mo & Cho and is monogrammed with my initials! Also, who can say no to polka dots?! To keep feet dry, don’t forget about the other rain gear essential: rain boots. 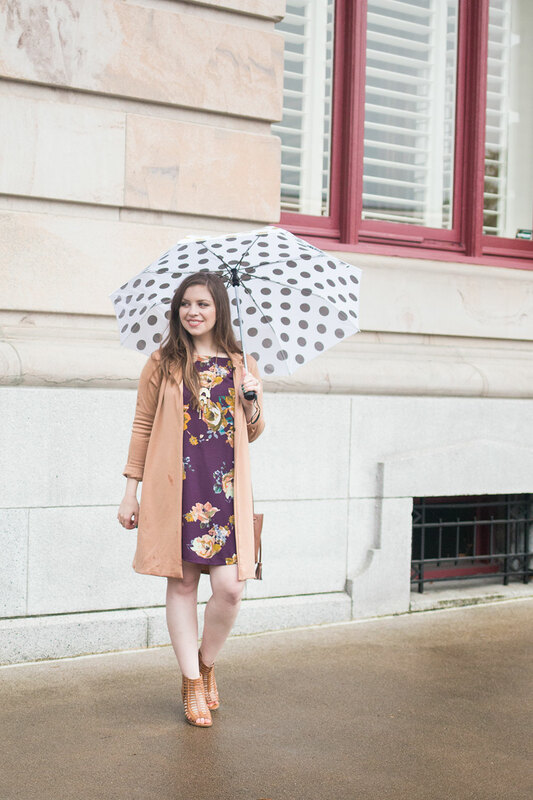 While perhaps not the most dressy shoe in the world, you can easily pack your dressy shoes and wear your rain boots until you safely arrive at your destination. I love a good suede bag or shoe, but for the love of your suede, please pack it away in the rain. Especially if it’s light-colored, there’s nothing worse than a beautiful pair of shoes dotted, permanently, by the rain. I lost a good pair of shoes that way, may they rest in peace. When the rain struggle hits, what do you like to wear? 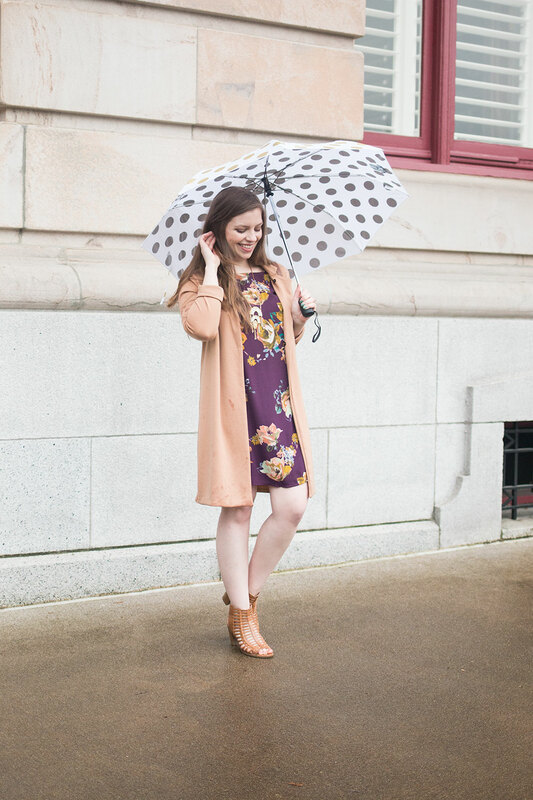 Are you brave and go bare-legged and open toed, or do you stick to boots and umbrellas? I’d love to hear what you wear in the comments! I completely understand the dilemma – living in Michigan the last 6 years means boots and a parka no matter what for a few months. Say goodbye to cute shoes from December- February haha. I also refuse to wear tights after the first day of spring, no matter how cold it gets! Aw thank you so much Portia! So obsessed with this look, especially the dress! And love the monogram on the umbrella! We’ve had so much rain lately and I’ve really struggled with my work wardrobe. Aw thanks Lindsay! 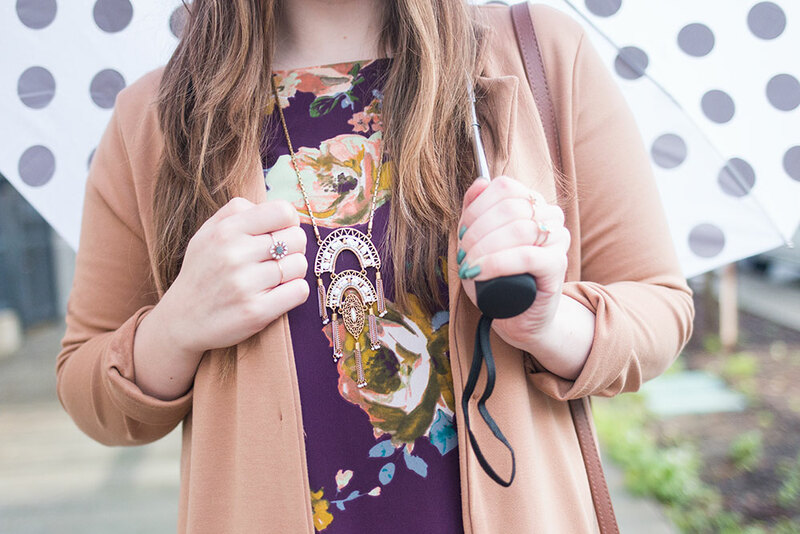 Rain is the worst when you’re wearing dressy clothes. I pretty much live in my hooded trench coat during the rainiest seasons. Love Mo & Cho and love that cute umbrella! I am definitely learning how to deal with rain down in the South! I also LOVE the color combo! Here in Texas, we have recently had some terrible storms. I am in college, and my typical outfit of choice when braving the rain is rain boots and an umbrella for sure. I’m not about ruining a good piece of clothing or shoes! Wait, Seattleites frown on umbrellas? Why? You make rainy days look good!! Aw, thanks Ashten! It was a fun day despite the rain! That umbrella is so fun! Thanks Chelsea! I thought so too! Your outfit is adorable! And the umbrella is really the perfect accessory! So fun!